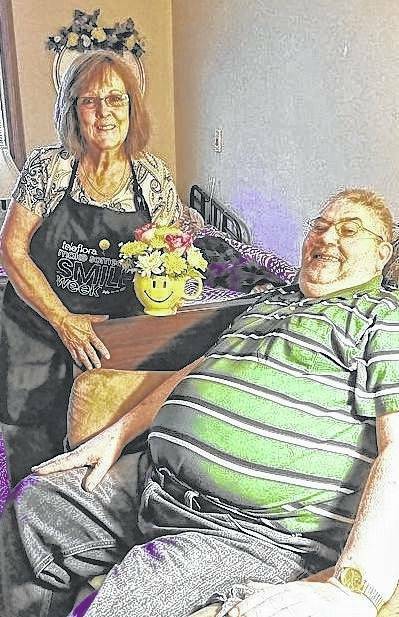 GALION — Patti Roston, owner of Toni’s Flowers and Gift Shop, entices a smile from Chuck Thomas on Tuesday at Magnolia Terrace. Patti, Ron Roston and the Toni’s Flowers’ staff were celebrating “Make Someone Smile Week” an initiative led by Teleflora. They delivered about 100 Smile Mugs filled with colorful flowers to residents at Magnolia Terrace and Galion Pointe. Flower Cart delivered flowers to Signature HealthCARE and Mill Creek.